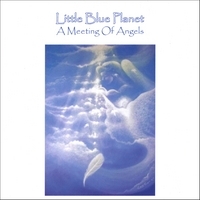 About halfway through A Meeting of Angels, Little Blue Planet had me weeping with them. The song, “This Hurt Is Too Deep for Tears,” is among the most heartbreaking songs about a broken relationship that I’ve heard in decades. The profound agony in Corry Suter’s singing is nearly impossible to bear; her voice is nearly cracking with pain and loss. It’s a shame such a devastatingly sad vocal performance will go unheard by millions of real music fans simply because Little Blue Planet do not have the push of a major label behind them. Then again, record companies have no room for naked, honest songs like this anymore. Consisting of Suter, guitarist Blue Ray Luxemburg (love that name), and harmonica player Shakey Reay Suter, Little Blue Planet are a Canadian folk trio that also delve into the blues and jazz. However, on “This Hurt Is Too Deep for Tears,” they actually approach the harrowing despair of the late Nico. Each member has an important role in shaping the sound of the album. Luxemburg’s acoustic riffs shift styles to fit each track, either laying down rainy-day atmospherics in “The Great Stretch” or aiming for brittleness as on “This Hurt Is Too Deep for Tears.” Shakey’s harmonica can be wonderfully bluesy at times; check out his scorching work on “A Good One” and “Song for C.” Suter is a wonder to behold. Her voice will haunt you when you sleep.